What was the debate between the Phyrrhonian and academic skeptics? Pyrrhonian skepticism was founded by Aenesidemus in the early first century B.C.E. Aenesidemus claimed to be merely passing on the thoughts of Phyrro of Elis (c. 315–255 B.C.E.). Sextus Empiricus (160–210 C.E.) preserved Pyrrhonian skepticism in the second century after Aenesidemus. Pyrrhonian skeptics thought that the academic skeptics went too far in claiming that nothing could be truly known for certain. The Pyrrhonians preferred to suspend judgment on whether anything could be known. They held that suspending judgment led to ataraxia—peace of mind—in which there was simply no concern for what may or may not lie behind appearances or come after them. Phyrrhonian skeptics were opposed to dogmatism and believed that their chief philosophic opponents were the stoics. 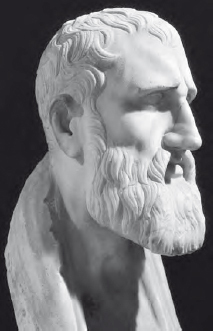 Zeno of Citium was the founder of stoicism (Art Archive).